Celebrating our 5th year providing the Mobile, AL region with the best lawn care service! Xtreme Turf Lawn Care is fully OTPS certified. This is a required certification if you are applying fertilizer and/or pesticides to control weeds and lawn insects. Sign up for the (6)application weed/ fertilizer and receive first application 1/2 off. Lawn fertilization is one of the best things that anyone can do with a lawn. This includes supplying a lawn with the needed nutrients that it would require for it to stay healthy and to grow as well as it can. There are a number of reasons why lawn fertilization is such a good thing for anyone to get into. 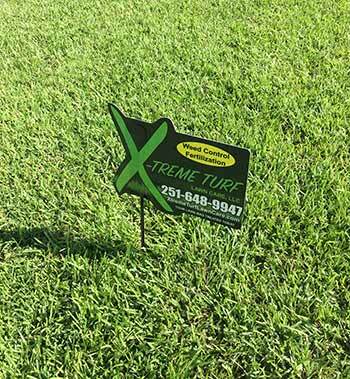 Xtreme Turf Lawn Care has very skilled and experienced team with a understanding of weeds and strategies outlined here. We attack weeds with pre and post emergence applied at proper times of year to attack cool and warm season weeds. This with proper fertilizer amount and maintenance practices will give your lawn a well-rounded program that promotes an overall healthy lawn which is the ultimate weed defense! Xtreme Turf controls fire ants by attacking the queen to eliminate the colony with a granular bait 2-3 times per year. One ant queen can produce thousands of eggs in a single day. Stop chasing mounds around your yard and call a Xtreme Turf Professional today! Xtreme Turf Lawn Care is working on Turf Pest Control from years with skilled and experienced team, who describes information needed for proper insect detection & control, the sampling techniques used to identify & diagnose the pest problems, make lists for most possible and suitable solution and factors to consider when developing a disease management program. We use Practices as irrigating and fertilizing, thatch removal, choice of mowing height and frequency, which has a major impact on lawn health. Xtreme Turf Lawn Care, has very skilled and experienced team to make Ornamental and flower bed, we are very keen and passionate to make such beautiful decoration. Some plants are annual and some dies through varying seasons so we maintain a sequence of bloom and good color combinations, organizes the flowers in bedding-out schemes. We also use different techniques like seed mixing for wild-flower, with this assortment we create beds that contains flowers of various blooming seasons, some portion should always be in bloom is an amazing feature of them, even by such combinations we can control the flower booming until the next season. Are Mole Crickets Destroying Your Baldwin County Alabama Lawn?